Sometimes, you want a light, refreshing breakfast of steel-cut oats and berries, and sometimes, you want to eat an egg, wrapped in an avocado, wrapped in bacon, topped with cheese. This creation—which a fellow diner remarked on a recent visit is both "very American" and "very Californian"—is from the kitchen of Chef Dakota Weiss at West Hollywood&apos;s Estrella, which opened on Sunset Boulevard last year. We were recently invited to sample their new cocktail menu, but the real highlight was this glorious monstrosity, called the Rolling Stone. 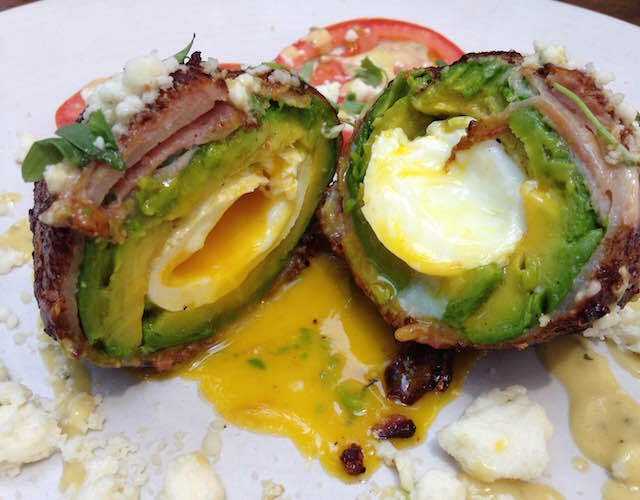 It is a soft-boiled egg, that has been placed inside a whole avocado, that&apos;s been placed inside a blanket of bacon. That bacon layer is hearty, too—double-wrapped, with strips going both vertically and horizontally. The result is a crispy, thick shell of meat, holding together a soft avocado and egg center. One might rationalize this to themselves by remember that avocado is the good kind of fat. The yolk runs out as the dish is cut, but it is still easy to share. After that much bacon, you might not want more bacon, but we feel obligated to tell you that there is more bacon. 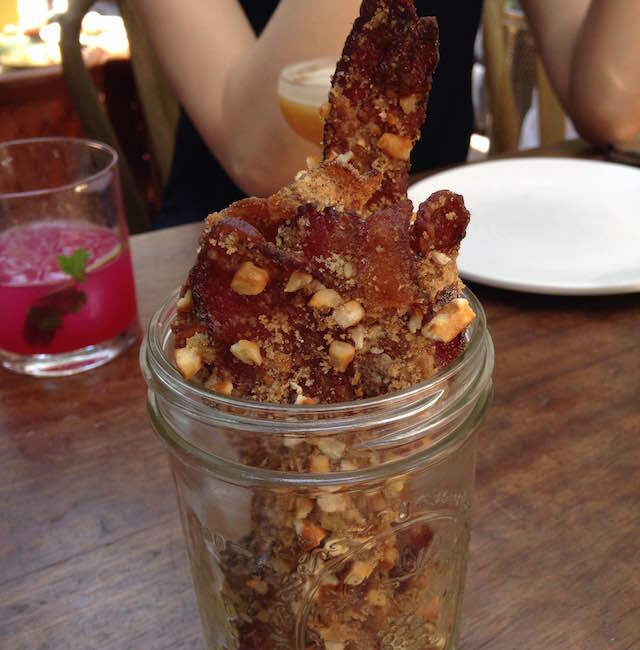 They serve candied, pretzeled bacon in mason jars. The Rolling Stone now has a second version, which is even more outrageous than the first. This is like when you realize the new Terminator can walk through metal bars. The Rolling Stone: Volume 2 is available at Estrella on Saturday and Sunday during brunch hours. Only a limited amount will be made each day, and guests who wish to try one will need to pre-order it 24 hours in advance. It costs $29. It is poached egg that is first wrapped in prosciutto before being gently entombed in an avocado lined with shaved Summer Black Truffle. Then the whole thing is once again wrapped in bacon, then adorned with more truffle and served with baby heirloom tomatoes and a truffle mustard vinaigrette made in-house. What Frankenstein&apos;s brunch item will Estrella come up with next? See a video from Food Steez where the chef creates the beast below.